Age-related changes in muscle strength, declining vision, and cognitive changes can all affect balance. Balance begins to deteriorate as early as 25, but the decline is more marked in your senior years. The consequences of declining balance can be catastrophic: falls are the leading cause of injury among seniors, and one in four seniors falls every year. A few simple balancing enhancing exercises can reduce your risk of a serious fall. Improving your balance doesn’t mean you have to invest in a gym membership or do a bunch of contortions. The following exercises are merely suggestions, if you notice significant balance problems make sure to consult your physician. Stand on one leg. Stand with your feet together, then steadily lift one foot off the floor, bending your knee as you do so. Hold for 3-5 seconds, then steadily build up to holding for 10-15 seconds over the course of 10 reps. Repeat with the other leg. Do back leg raises. Stand behind a sturdy chair or other piece of furniture while gripping it for balance. Then lift one leg directly behind you without pointing your toes or bending your knees. Hold for 5-10 seconds. Repeat with the other leg. Do 5-10 reps.
Switch to side leg raises. Stand in the same position as for back leg raises. Then raise your leg out to your side as high as you can comfortably elevate it. Hold for 5-10 seconds before switching to the other leg. Repeat 5-10 times. Improve eye tracking. This supports your vestibular system, which controls balance. Hold your thumb in front of your face at eye level, about 12 inches from your nose. Move your thumb slowly to one side, then to the other. Track your thumb with your eyes, without moving your head or any other body part. Next, move your thumb up and down while tracking it. Repeat 5-10 times. Perform a balance walk. Hold your arms out to the sides, at shoulder height. Focus on a single focal point ahead of you. Without looking down or adjusting your posture, walk forward 20 steps. As you step, place your heel just in front of your toes such that you are walking heel-to-toe. Remaining active can become more difficult as you age. You may fear falling when you exercise, feel less motivated to work out, or struggle with chronic pain. At Arbor, we are committed to helping seniors remain active at every age. We work with each resident to find ways to keep moving and improve balance. 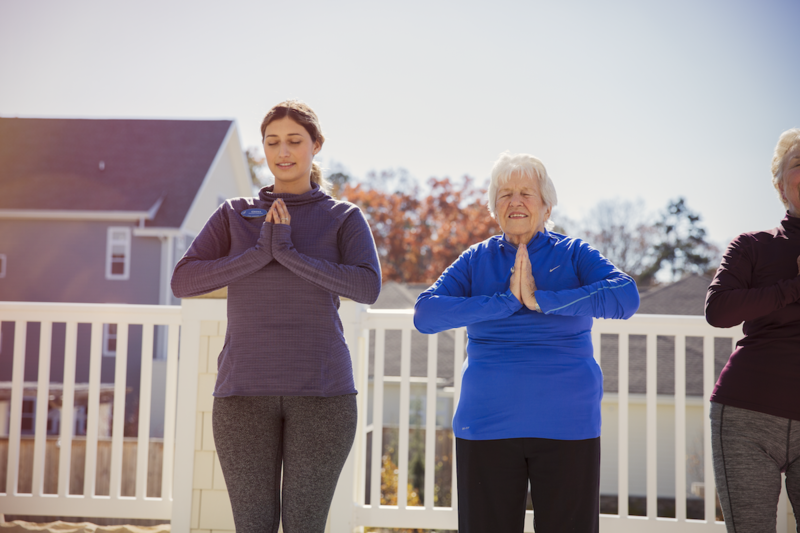 Many of our communities offer yoga classes, chair aerobics, and senior strength training. It’s easier to get moving when your neighbors are doing it too, and when you know you’re in a safe space where the risk of a fall is minimal. We would love to help you stay active so you can make the next chapter of your life your healthiest yet. To learn more, check out our guide to recreation in retirement.